It’s hard enough to imagine experiencing homelessness on the streets, even harder to imagine navigating the city—and the system—without the benefit of sight. It was reality for Jeffrey, 57. He was sleeping in a bunk at Catholic Charities’ Higher Ground Minneapolis shelter and had been experiencing diminished vision for more than a year. At first, Jeffrey didn’t realize he had cataracts. He just knew his sight kept deteriorating. He feared the worse and admits he put off treatment because he had little hope of seeing again. 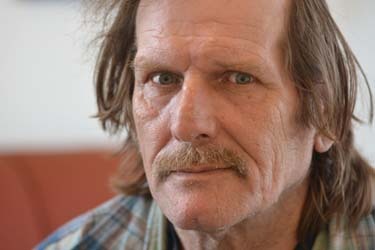 Jeffrey struggled to find his way from the shelter to the places he needed to go, such as Catholic Charities’ Opportunity Center and Hennepin County Medical Center. When his caregivers realized Jeffrey’s predicament, it was suggested he move to Catholic Charities’ Exodus Residence. Jeffrey needed surgery and living on the streets—only going to the shelter at night—wouldn’t help his recovery. The medical care program at Exodus is for people who aren’t considered ill enough to be hospitalized but are too ill to recover from illness or injury on the streets. Residents at Exodus often transition to a health supported program which requires less intensive care. At Exodus, Jeffrey had his own room where he could stay all day. He had the support of nurses who ensured he took the proper medication at the appropriate times. He had three healthful meals served daily. Jeffrey didn’t have to go out in the elements and navigate the streets to find what he needed, because everything was right there. Recovery and living a healthful life was his focus. Jeffrey’s surgery was a success and he now enjoys clear vision without the need for glasses. “Now that I can see, all I want to do is read. I like reading the newspaper, even just basic mail. I can read that again without any help,” he said. Jeffrey returned to Higher Ground Minneapolis, but not to the shelter, to a room of his own on the fifth floor. Now he has privacy and security in his own room. He can lock the door on his home and come and go as he pleases while having the assistance of a designated case manager. Jeffrey volunteers there doing laundry and is involved with activities as they are available, even giving yoga a try.